Half a gig, downloading pretty fast right now. It's basically that Exploration video I posted earlier :D Just with numbers. Edit: I see it all now, durrrrrr.... great article btw. I'm curious to see how this will run on my machine (q9550, gtx460). It's a bit older, but 1.0 actually ran pretty well, so I'm really optimistic this will run great and look fantastic. My download is also going quick, 1.2mb/s (which is as fast as my provider allows me to go on this package). Fully voiced event dialogue imparts every note of character emotion, and 5.1 channel surround sound completes the experience, wrapping players in the stirring music and the atmospheric effects of FINAL FANTASY XIV: A Realm Reborn. That's from the benchmark page...so that's odd. I'll post my numbers in a bit, running it at Max with 1920 x 1080 res. It's an issue with my computer I think. If you're on Win7 it should unzip when you double click on it, then click the Extract files button at the top. -Easily capable of running the game. Should perform well, even at higher resolutions. 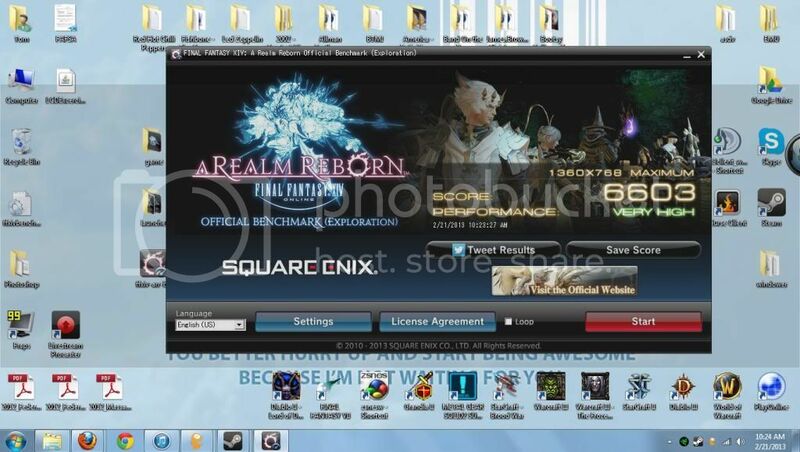 Benchmark results do not provide any guarantee FINAL FANTASY XIV: A Realm Reborn will run on your system. (C) 2010-2013 SQUARE ENIX CO., LTD. All Rights Reserved. I reDL it for a 3rdtime for the charm. Thanks. Looks like my i5/460 should do ok till I can afford a 670, nice. -Easily capable of running the game. Should perform exceptionally well, even at higher resolutions. Just built this pc im so happy it performed well!!! CANT WAIT!!! Not bad considering my machine, had everything maxed out and it ran really well. Didn't notice if there was a full screen option though? The 1920x1200 didn't fit 100% on the one monitor. NVIDIA GeForce GTX 460(VRAM 2769 MB) with 4 gigs ram for those curious about the non newer core i-X machines. Anyone else getting points on some character models that stretch out into a spike? Running GTX660TI with the latest drivers. Doesn't appear on all models, just NPCs as far as I can tell... So far it appears in Maximum and High settings. I'm not seeing that, do you have updated drivers? Yeah I didn't see one either unfortunately.